Talk about interesting discoveries this week...Woohoo! Here's another one. I have to say I have been very impressed with the updates to records on FamilySearch.org. If you have North Carolina roots people, get thee to FamilySearch because there is a ton of good information available online. Keep in mind some of these records are indexed and some are not. If you have time and patience though you may be able to uncover some really cool things. The most recent thing I found was in the North Carolina, Probate Records, 1735--1970 collection under Carteret County Wills for 1925--1948, Vol. G. It was the probate record and will for my 2nd great grandmother, Jonas Bryant. Jonas Bryant was the mother of my great grandfather Frank Bryant of Morehead City, NC. I know very little about my 2nd great grandmother. From information found in census records, I know she worked at one point as a clammer but more often she worked as a maid. Anyway, when I came across this record, I was especially excited. Any little tidbit I can learn about Jonas just makes her more real for me. The last paragraph on the page shows my 2nd great grandmother's will. I have to say I teared up upon reading it. Morehead City, N. C. October 6th, 1925. 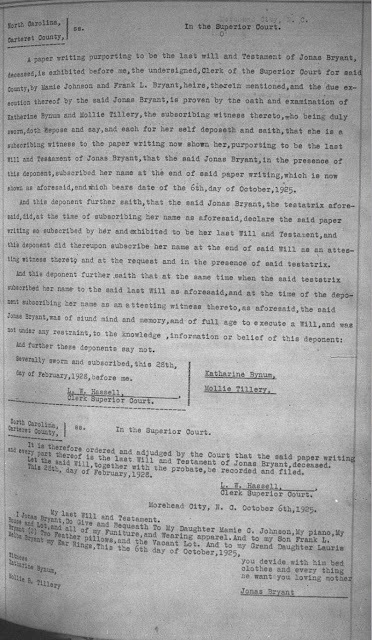 The will was drawn up on October 6th, 1925. Jonas Bryant died October 18, 1927, just a little more than two years later. I wonder what she was like. Did her son Frank favor her in regards to looks. Was she kind? Who was the father of her children? This remains a mystery to me. I hope that the spirits will be kind and one day lead me down the right trail to his identity. We'll see. 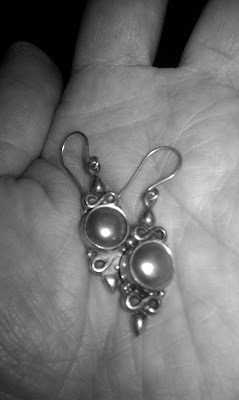 I find it so sweet that she left her earrings to my grand aunt Loris Melba Bryant. Loris was born January 2,1918. She was 9 years old when her grandmother passed away. She would have had the opportunity to know her grandmother. My aunt passed away in 1987, long before I had an interest in family history. I wish I could go back in time and ask aunt Loris about her grandmother Jonas and perhaps those earrings too. Thank you for this poignant account. I salute the driving force of your curiosity. And she meant what she said. I can hear my Mom saying and emphasizing that we were to divide everything equally like that. I have left my Granddaughter earrings also.....sweet touch. Thanks True! Oh If only we had time machines so we could go back and ask all those questions that keep haunting us. Wow! So glad you found the will and probate records. It is such a great find. Thanks Betty! I feel blessed that I have been able to find so much online. How lovely, a will tells who is on the person's heart. Thanks for reading! I hope you have a great weekend as well. This will really shows the personality of Jonas, wanting to be fair to her children, especially the last charge: "you divide with him bed clothes and every thing he wants." And the earrings to her 9 year old granddaughter! I don't suppose your grand aunt had any children or nieces . . . but I'm thinking of recovering the earrings when the important thing is, you've already recovered the memory. My grand aunt did have children of her own. I will have to see if those earrings were passed down in the family.